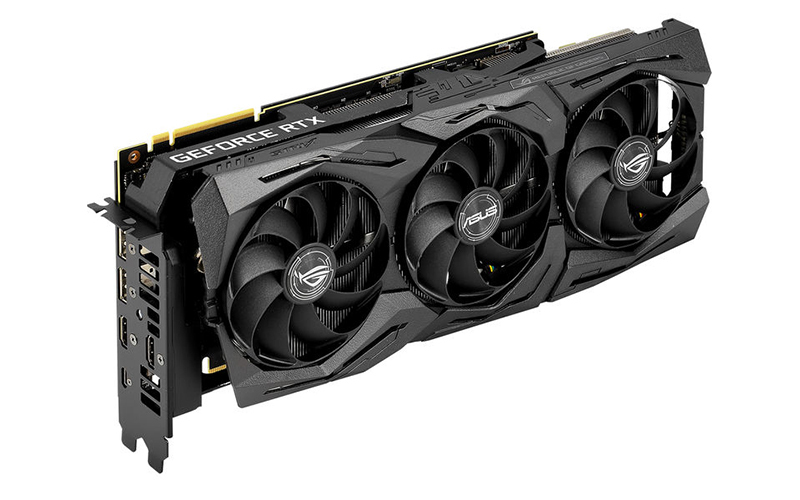 The NVIDIA GeForce RTX 2080 Ti is one of the most expensive consumer graphics cards NVIDIA has released in a while. It serves up bleeding-edge performance and comes with the latest ray-tracing technology baked in, but the steep price it commands means that this isn’t a card for the average gamer. Put simply, this is a card for those who are sure that they want the best and are willing to pay for it. While the Founders Edition model is a beauty in its own right, custom card manufacturers have gotten to work installing massive coolers and working in their own factory overclocks. This means cards that are slightly faster and cooler, complete with fancy add-ons like RGB lighting, and in some cases, even customizable OLED displays. 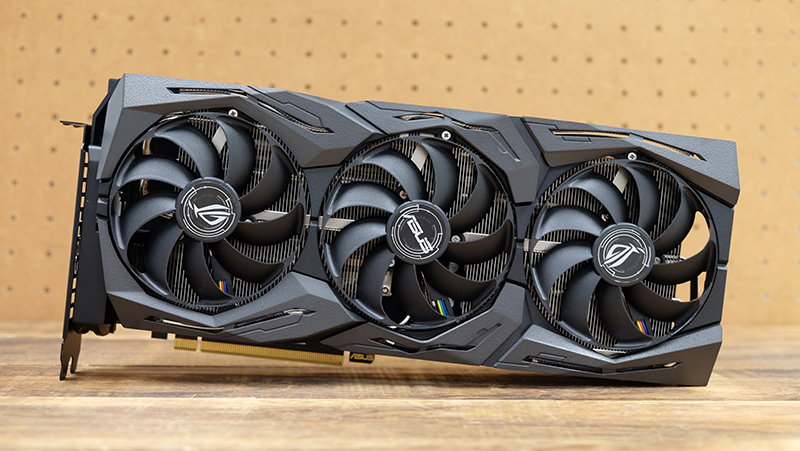 In this shootout, I’ll be looking at cards from ASUS, GALAX, MSI, Palit, and Zotac to try to tease out which GeForce RTX 2080 Ti you should get. Unfortunately, Gigabyte chose not to take part in this shootout, which is why they’re not being featured. 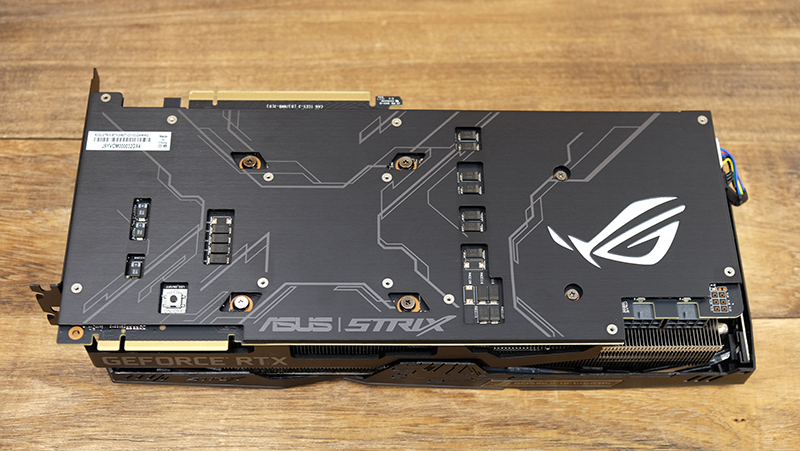 The ASUS ROG Strix GeForce RTX 2080 Ti Gaming OC is basically the same card as the ROG Strix GeForce RTX 2080 OC I reviewed previously. 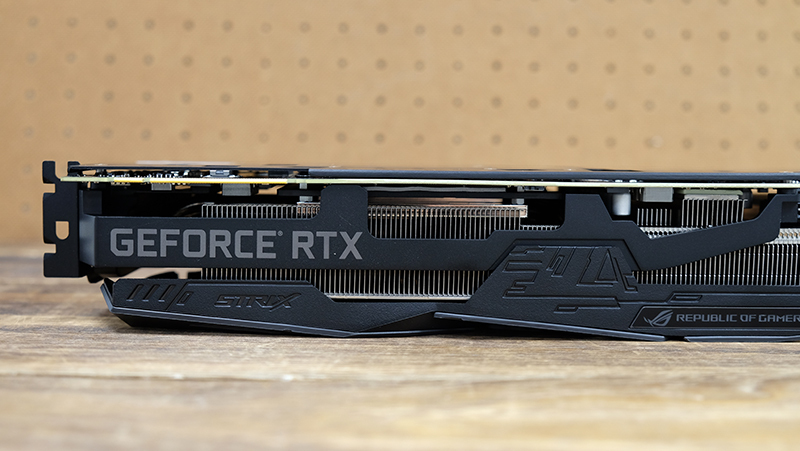 The GeForce RTX 2080 Ti version is ever so slightly longer, but they’re otherwise indistinguishable if you’re not squinting at the labels. This means that a lot of what I said about the ROG Strix GeForce RTX 2080 Gaming OC applies here as well. 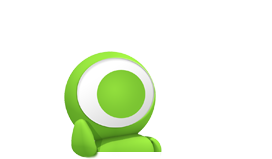 This is a premium card that’s been crammed with nearly everything you could want, and it comes with a couple of unique features that help to improve the overall user experience. 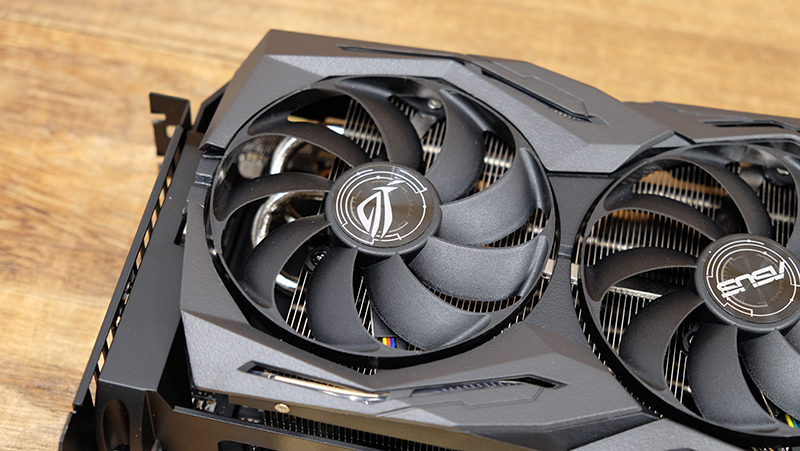 The massive triple fan cooler does an admirable job of keeping the card cool, and ASUS says that it has managed to increase the available surface area on the finned heat sink by over 20 per cent compared to the previous generation. The company’s MaxContact Technology makes a return here as well. This refers to ASUS’ use of precision machining to create a heat spreader surface that is flatter than competing solutions. This increases the total contact area between the GPU and the contact plate, which should also improve heat dissipation. 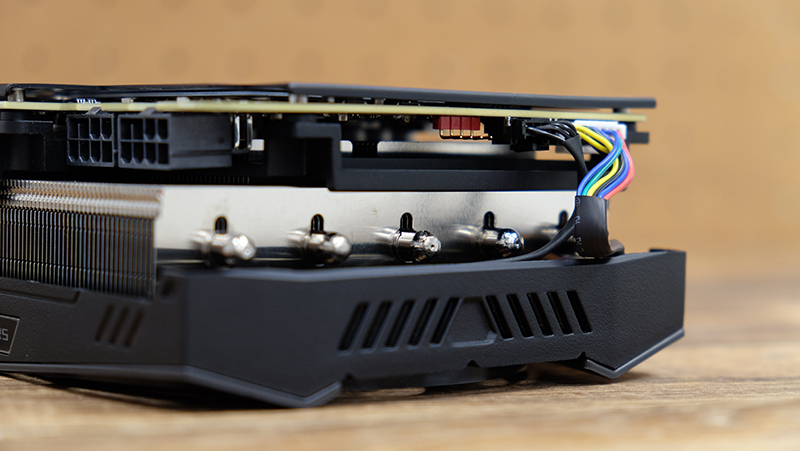 The cooler is super thick and requires a nearly 3-slot allowance, so be sure to make sure that you’ve enough space in your chassis for this. But as with any card that’s this large and heavy, a big concern would be structural integrity. Fortunately, ASUS has made attention to this area, and the card feels really robust and well put together. There’s even a hefty metal brace that’s mounted to both the backplate and I/O shield, which helps reinforce the PCB and prevent bending. This card never gets unbearably loud, but the onboard dual BIOS switch provides an easy way to reduce noise levels if you need to. There are two different modes, performance and quiet, but the card ships in performance mode by default. Quiet mode also supports semi-passive operation for the fans, where they will stop spinning when GPU temperatures fall below 55°C, but you can enable this in performance mode if you have the GPU Tweak II software installed. Both modes share the same power target settings, but performance mode adheres to a more aggressive fan curve for better cooling performance. With this generation of cards, ASUS has also switched to new axial-tech fans that provide higher air flow and greater static pressure. These fans also have a smaller fan hub to allow for longer blades and a barrier ring that increases structural integrity and downward air pressure so air can be pulled over the thick heat sink more effectively. Furthermore, they are IP5X dust resistant and the numbers in the results page will speak to just how well ASUS’ entire thermal design works. 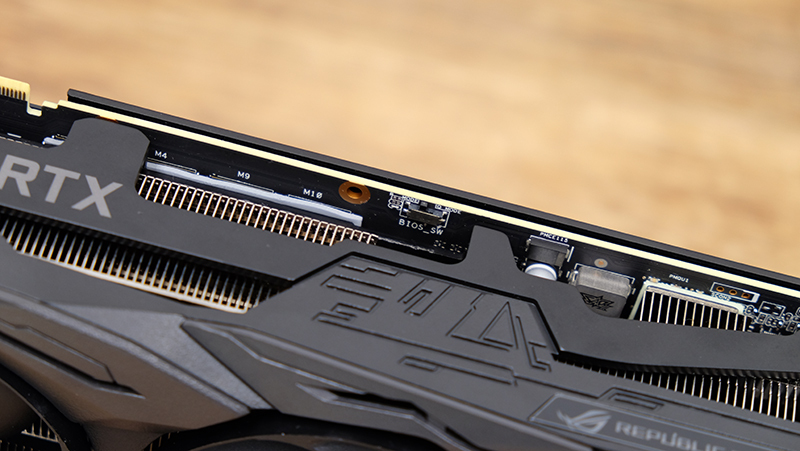 On the overclocking front, the card uses a 16+3-phase power design, compared to the 10+2-phase design on the ROG Strix GeForce RTX 2080. 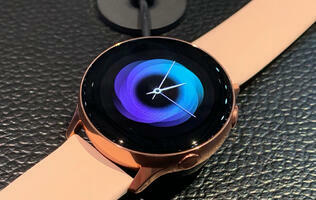 In OC mode, it has a base clock of 1,350MHz and boost clock of 1,665MHz. On paper, this is far from the most aggressive factory overclock among custom 2080 Ti cards, but the good news is that you don’t actually see that much of a difference in real-world benchmarks. Having said that, the card ships in Gaming mode, with a lower 1,650MHz boost clock, and I do wish that OC mode would be enabled by default. 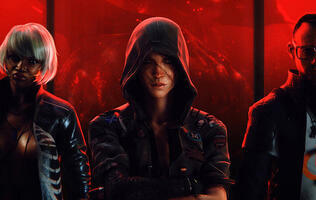 Instead, you have to download ASUS’ GPU Tweak II software to enable it. The cooling shroud is adorned with segments of RGB lighting, but I consider the card’s design to be quite subdued compared to the rest of the competition. But if you want an even more stealthy look, there’s also a button on the backplate of the card to let you quickly turn all the LED lights on or off. That’s not super useful if the card is going to be in your chassis most of the time, but I do appreciate it being there. On top of that, there’s a 4-pin header for connecting a third-party LED strip. If you use something from ASUS’ Aura ecosystem, you’ll be able to control all the lighting through the Aura software. The card comes with two additional 4-pin fan headers as well. These FanConnect II headers, as ASUS calls them, will work with both PWM and DC spinners. 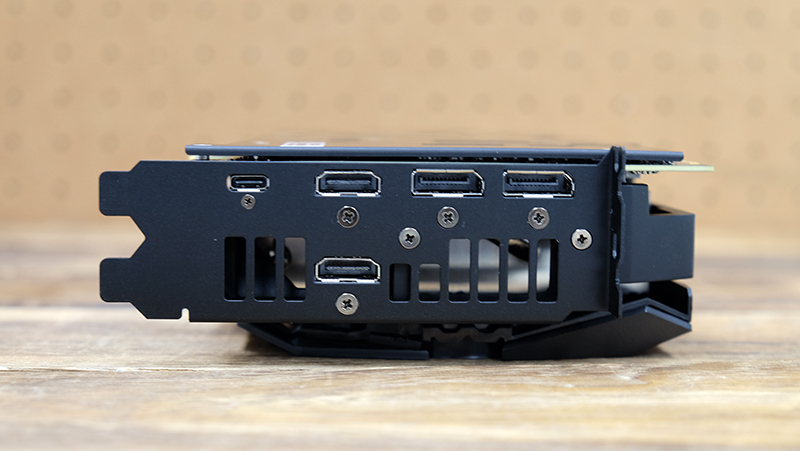 Fans hooked up to these headers can be pegged to your GPU temperatures instead of just the CPU, which is probably more useful during intense gaming sessions. However, you'll see that the headers are actually missing in the picture above. 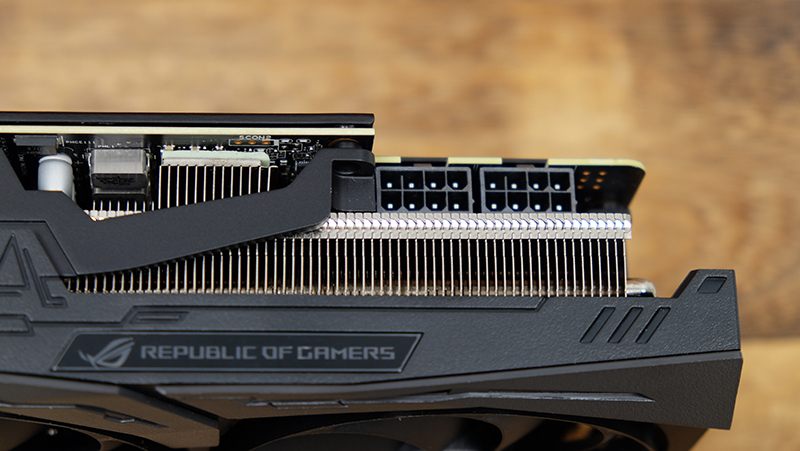 That's because the initial batch of the ROG Strix GeForce RTX 2080 Ti Gaming OC omits these headers due to some technical issues, but future production batches will include them. The display outputs are slightly changed from the Founders Edition model. Instead of three DisplayPort and one HDMI output, ASUS has gone with two of each type (the VirtualLink USB-C port remains unchanged). Finally, there are just two 8-pin power connectors, the same as on the Founders Edition card. Two helpful LED indicators will turn white once a successful connection has been established, which should help rule out loose connections when troubleshooting.